World’s deepest “blue hole” has been discovered in the South China Sea, and it is named “Dragon Hole”. With the depth of 300.89 meters (987.2 feet), it surpassed the Dean’s Blue Hole in the Bahamas, which is 202 meters (663 feet) deep. For a comparison, the Eiffel tower is 324 meters (1,063 feet) tall, so the Dragon hole could swallow it almost completely. The Dragon Hole, world’s deepest blue hole, located in the South China Sea, is deep enough to swallow nearly the entire Eiffel Tower. A blue hole is a large marine cavern or sinkhole. They are roughly circular, steep-walled depressions, and so named for the dramatic contrast between the dark blue, deep waters of their depths and the lighter blue of the shallows around them. Their water circulation is poor, and they are commonly anoxic (depleted of dissolved oxygen) below a certain depth; this environment is unfavorable for most sea life, the can support large numbers of bacteria. 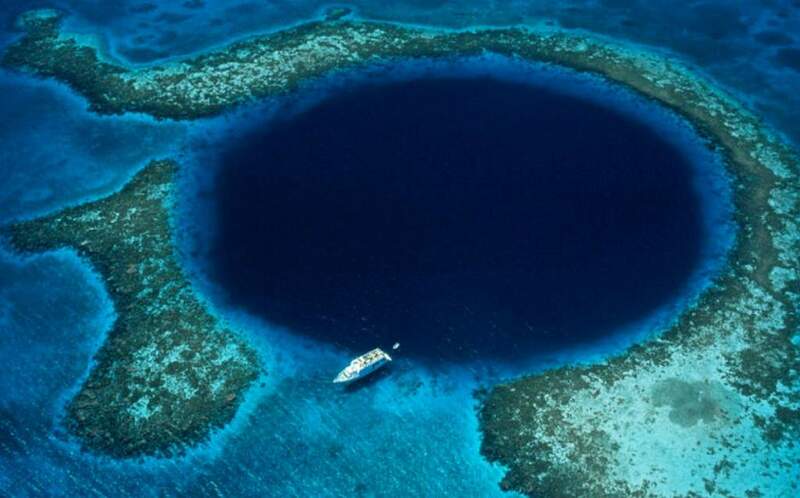 The most famous Blue Hole is the Great Blue Hole, a giant submarine sinkhole off the coast of Belize. It is really big in diameter, but compared to the Dragon Hole, it is not that deep: it is over 300 meters (984 feet) across and 108 meters (354 feet) deep. Blue holes formed during past ice ages, when sea level was as much as 100-120 meters (330–390 feet) lower than at present. At those times, these formations were targets of the same erosion from rain and chemical weathering common in all limestone-rich terrains; this ended once they were submerged at the end of the ice age. There are several fresh water sinkholes on land that are even deeper than the Dragon Hole. These include the 335 meters (1,099 feet) Zacatón in Mexico at 335 m (1,099 ft) and the 392 meters (1,286 feet) Pozzo del Merro in Italy. 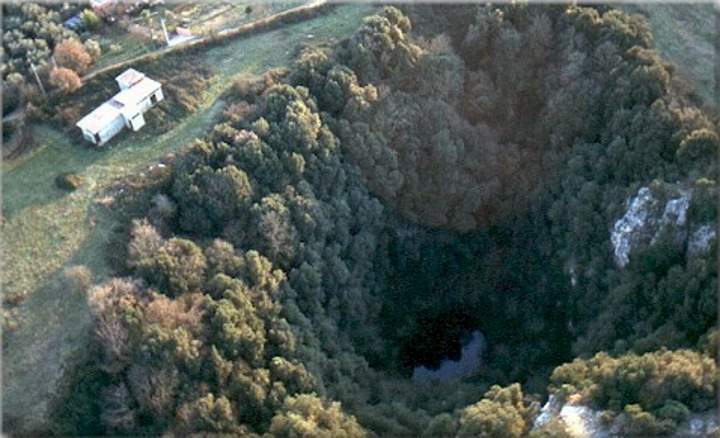 Pozzo del Merro (English: the Well of Merro) is a flooded sinkhole in the countryside northeast of Rome, Italy. Situated at the bottom of an 80 m conical pit, at 392 m (1,286 ft) it is the deepest underwater vertical cave in the world. In 2000 two ROVs (Remotely operated underwater vehicle) were sent to explore its depths; the first, the “Mercurio (Mercury)” reached its maximum operative depth of 210 m (690 ft) without reaching the bottom. The second ROV, “Hyball 300”, reached 310 m (1,020 ft) without touching down either. A third dive in 2002 with the more advanced “Prometeo” robot reached the bottom at 392 m (1,286 ft), but discovered a narrow passage continuing horizontally. The sinkhole was formed by volcanic activity eroding the carbonate rock.